A tenacious fungal infection made headlines in a nasty way. 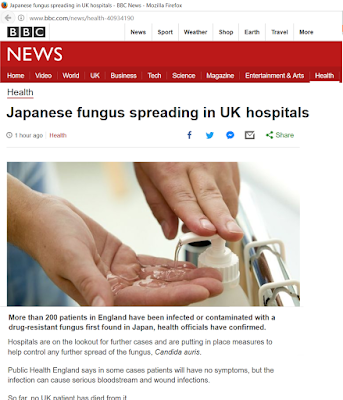 Reportedly nobody in the UK has died from this infection. Why's this fungus labeled Japanese? Is it reasonable to scare the world about Japan? Can a potentially deadly fungus hinder the 2020 Tokyo Olympics? Negative publicity harms efforts marketing Japan. Infections have been reported in the United States (predominantly in New York state), Canada, India, Pakistan, Japan, South Korea, Venezuela, Columbia, Israel, Oman, Kuwait, Kenya, South Africa, Norway, Germany, and Spain, as well as the UK. The US Centers for Disease Control (CDC) states "Because identification of C. auris requires specialized laboratory methods, infections likely have occurred in other countries but have not been identified or reported." The CDC (link) notes that "C. auris has emerged independently in multiple regions at roughly the same time." Exceptional hospital hygiene is very important. How much should we worry? Should we stay away from the above nations, or especially avoid Japan? No - anyhow don't change your travel plans due to this fungus. There are many worse dangers, e.g. from ticks or mosquito bites. National governments might pressure medical researchers to avoid publication if such findings become a national problem or an economic liability. Negative media can quickly become bad for us all when public health problems are misreported. This BBC scare headline is bad journalism.